...that Project HAYABUSA was a rival to Project MJOLNIR? ...that the M808 Scorpion has been in service since 2218? This article's title is a callsign, an alias, or a nickname, as no proper name for the subject has been revealed. You may be looking for the Spartan Ops level or for the section from the Halo 2 level Outskirts. Sniper Alley is the UNSC codename for a location on the Forerunner shield world Requiem. The area known as Sniper Alley on Requiem. The Sniper Alley location is an area on Requiem that leads to the power core for the planet's particle cannon network and the AI personality of the Librarian. John-117 entered the area to neutralize the particle cannon network to allow him to reach and destroy the gravity well holding the UNSC Infinity on the planet. After clearing Unggoy and Kig-Yar from the area, John-117 faced Promethean forces. He managed to defeat all of them and progress within the structure and disable the network. Six months later Covenant forces had put up an energy source and were drawing energy from the Forerunner mechanisms within the planet. The Infinity sent in Fireteam Crimson to locate the power source and eliminate the Covenant in the area. Crimson was successful and an air strike was conducted, destroying the generator. Crimson then was extracted from the area. Later en route to the Refuge, Crimson's Pelican was shot down by Covenant-run Forerunner anti-air turrets. Crimson managed to survive, clear Covenant from the location yet again, and disable the turrets. Crimson then continued to the Refuge. Despite their two defeats, the Covenant did not give up on the location and re-established a presence, secretly communicating by using a generator in Sniper Alley. Once again, Fireteam Crimson had to eliminate the Covenant at the location and destroy their target prior to extraction. 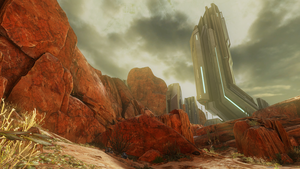 The name may be a reference to Halo 2's level Outskirts, where an especially challenging section filled with Kig-Yar Snipers was dubbed by players as "Sniper Alley". The back of the canyon is closed off for gameplay reasons in Spartan Ops. View of a Forerunner tower structure on Sniper Alley. Another view of the Forerunner tower structure. Forerunner structures on Sniper Alley. ↑ Spartan Ops, Episode 1, Chapter 2: "Sniper Alley"
↑ Spartan Ops, Episode 2, Chapter 4: "Pelican Down"
↑ Spartan Ops, Episode 4, Chapter 1: "Hairy Call"